Google has been pretty busy lately on the YouTube platform, releasing several design and layout changes to the site as well as new features to various parts of it. Today YouTube announced that they have added a new option to the site's video editor that uploaders can make use of to make lightweight modifications to the videos that they upload to the site. Face Blurring basically allows you to blur faces on videos. Where may this be useful? Think of an interview with someone that does not want to be visible on YouTube, or where it would make sense to hide the face, for instance when you are filming in countries that do not have that high standards when it comes to civil rights. The new feature does not appear to be available for all user accounts yet. I just checked my YouTube account and could not find the blur all faces option. 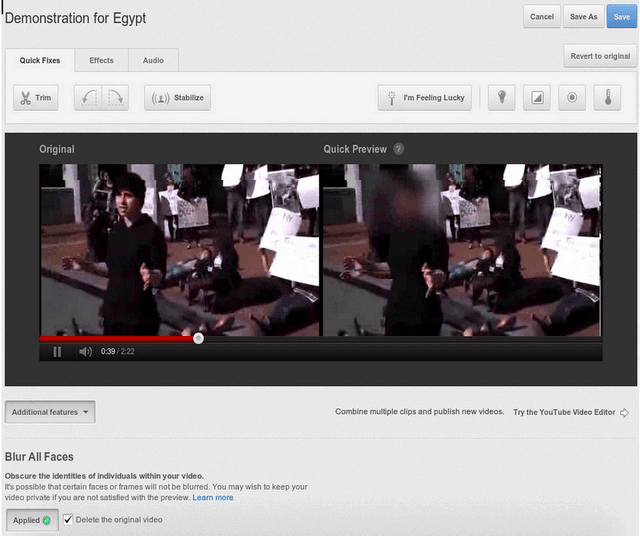 To see for yourself click on the small arrow next to edit on the video manager screen and select enhancements from the options. If the feature is enabled, you should see an additional features button below the video preview. Click on it, and you should see the blur all faces option. If you want, you can get the original video deleted automatically. YouTube is creating a copy of the video otherwise. The developers note that face blurring is an emerging technology, and that results may not always be what you expect them to be. It can happen that certain faces or frames in the video are not blurred properly or at all. The only option in this case is to keep the video private, or use third party video editing software to blur the faces professionally. It is nevertheless a step in the right direction and very likely that the feature will be improved over time on YouTube. What's your take on the new feature? I’d have really big concerns about using this. Do you really want to be uploading the unedited version and trusting that it won’t be somewhere, at least temporarily, where the people you are hiding identities from can require the unaltered version be turned over? It may be an option if it is your only one. Oh, like the USA and UK, for example. lol be sure to blur those cops faces when they are beating you.